Our newly updated Soultions Sourcebook offers 40 real world oil skimming implementations. See how our skimmers work! Click here to get your copy now! Oil skimming is a dirty job. However, it is an important part of numerous industries. Some industries utilize oil skimmers to help stay in compliance with EPA regulations and to keep hydrocarbons out of the environment. Other industries need oil skimmers to help prolong tool life or keep the work place a healthy place for the plant operators. Regardless of the reason, oil skimmers offer a simple, cost-effective, and environmentally sound solution to removing hydrocarbons from any application. A customer in South Korea recently contacted Abanaki in search of a wastewater skimmer. The company is a steel mill that makes hot and cold rolled steel, as well as other types. The problem the facility was facing was that lubrication grease and oil from the production line was ending up in the wastewater pit. The water cannot be discharged until the grease and oil levels are reduced to environmentally safe levels. 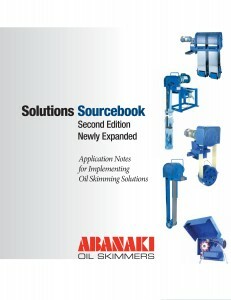 After further assessment of the company’s manufacturing process, Abanaki suggested it use a Grease Grabber ® Belt Oil Skimmer to solve the problem. This skimmer is capable of handling thick greases and oils due to its belt drive assembly that physically pulls the belt through the wiper blades. 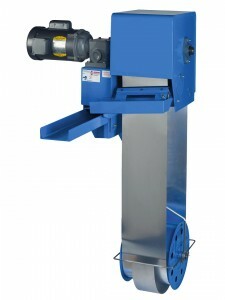 The heated discharge hopper thins down the grease to make for easier discharge of the recovered product. By adding the Grease Grabber as a wastewater skimmer to its process, the company was able to remove the floating greases and oils from the wastewater pit, the pollution levels were reduced and met environmental standards. A US customer utilizes an Oil Viper Tube Skimmer at an abandoned steel mill in an old scale pit. The tube skimmer is used to collect the oil that leaches from the scale. Within the first 24 hours of use, the Oil Viper reclaimed 250 gallons of oil. Because of the immediate success they saw with the initial tube skimmer, the plant operators chose to get a second Oil Viper to help speed the reclamation process along. The skimmers will be used all year long with the exception of the winter months, in which the pit will freeze over.